Nancy lives in Puerto Rico and was in New York for a few weeks. She emailed be about taking a soapmaking class. She had tried a few times to take one in Puerto Rico, but each time there was a class scheduled, something came up and she couldn’t get there. Nancy saw that I had been to Haiti, and thanked me for going there to teach. She was staying on Long Island, not too far from me, and was wondering if I had any soap making classes while she would be in the area. Unfortunately, I didn’t, but we were able to arrange a day for her to come and do a private soapmaking class. Nancy was studying aromatherapy and was interested in all things natural. She wants to make soap with oils infused with calendula and chamomile and plenty of essential oils. I went over safety precautions with Nancy and showed her how to use an online lye calculator. We talked about how to formulate her own recipe, what a superfat is and where she could purchase supplies. She was a quick learner and caught on to soapmaking pretty quickly. She loved the natural clay we used and asked questions about how to naturally color soaps. I told Nancy about the book Coloring Soaps Naturally by my friend Ruth Esteves. 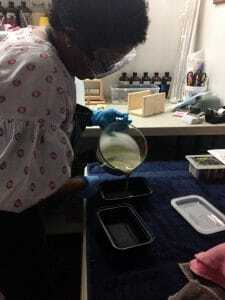 I love soap making and I love sharing my knowledge and teaching people how to make soap. I especially love teaching a private soapmaking class, because when teaching one-on-one I can tailor the class to the student. Nancy plans on making soap as soon as she gets back to Puerto Rico. She told me she was going to place an order for all the things she’ll need now, so it’ll be there when she gets home. I’m grateful to have met Nancy, and to have started her on her soap making journey. I have had so many wonderful students, many who have become friends. I love to see how they are doing. Some make soap as a hobby and some have started a business. Some have moved on to another craft and don’t make soap at all. It doesn’t matter to me, I’m so grateful for all the people I have met through teaching soap making. What are you grateful for this week? How cool you offer classes and get to teach what you enjoy so much. I love hand-created products because there is usually so much love and passion involved. Thanks Christina! I agree, if something is handcrafted, it’s done with love and passion. More people to make natural products is such a good thing! Supporting smaller businesses will help shift the energy of the world too. I love how you are helping others empower themselves to do something they love. Thanks Michele. I do believe in thinking globally and acting locally. And supporting a small business is one way to do that. So great. I love how you inspire people! What’s the difference between Soap Nite and a Soap Making Class?